Today Komaki Shinmeisha is located at a distance of about 300m in the north of Mt. Komaki. To tell the truth, when Oda Nobunaga suggested building a castle in Mt. Komaki and moving from Kiyosu in 1562, his retainers hated the idea and were afraid of moving, because they thought that a curse would fall on them afterwards. Therefore, Nobunaga brought a part of the spirit of Kiyosu Shinmeisha with him, in order to dispel their anxieties. Later Oda Nobukatsu, Nobunaga’s son, and Tokugawa Ieyasu also prayed for victory in the Komaki Nagakute battle at Komaki Shrine when they made their base at Mt. Komaki. In the Edo Period’s Edo shogunate, started by Tokugawa Ieyasu, his son Tokugawa Yoshinao became the first lord of the Owari Tokugawa clan and lived in Nagoya. When he rebuilt Komaki town, the Shrine was relocated to its present place. After the Meiji Era the name of Komaki Jinja (Shrine) was also changed into Shinmeisha. The main deity worshipped at Shinmeisha is Amaterasu Omikami, the Sun Goddess, who is the most popular deity in Japan; the deity of Tsushima Shrine and Akiba Shrine are enshrined together within the same precinct. Shintoism is not a monotheistic religion like Christianity or Islam but is a form of polytheism. The deities of Shintoism are not so different from the many Greek deities who exist in the world of Greek mythology, residing in all things in the natural world and playing an individual role. You can visit these shrines, which enshrine a variety of deities, at various places when you travel in Japan. Incidentally, Komaki Shrine has a calm atmosphere like a typical shrine. It is very popular with the citizens of Komaki, because a special festival featuring its own charm is held every season. Here is an explanation of the festivals in the order of the seasons. son of Shogun Tokugawa Ieyasu. These days the festival is held on the second Sunday of every April. People display the Dashi float within the precinct of the Shrine. Children perform Nihon Buyo (Japanese dancing) on the stage of the float instead of Kodomo Kabuki (children’s kabuki). The spring festival is very popular, as everything the dancing children does is charming to watch. It’s a pity that the number of dancing children is gradually diminishing. The next festival is Akiba Matsuri, which is held on a Saturday and Sunday around August 20 every year. This festival cerebrates one of several shrines enshrined in the precincts of Shinmeisha. The origin of this festival is not clear, but it is said that the festival has its origin in the Edo Period when Komaki-juku post-town was built: people wished the deity would protect the town from fires, because the Akiba Shrine which has its roots in Shizuoka, is dedicated to the deity which protects us from fires. The big event of this festival is that we can see a rare and magnificent view of four units of five-meter-tall festival floats, which were built in the Edo Period and kept in a hangar in the precincts of the Shrine. In the evening of the first day of the festival, Saturday, the four floats with many paper lantern ornaments prepared by each neighborhood association appear on the main street, Dogwood Street, on the north side of Rapio Mall before commencing their parade. Above all, after night falls the paper lanterns of those floats are lit and pulled by the participants to turn the corner of the road. The spectacle is a powerful performance. This is called “Donten”, and here the festival reaches its climax. On the next day, Sunday, the four floats start from each block and stop in front of the roof-deity enshrined in the small shrine on the roof and give a performance with amusing and sophisticated mechanical puppets installed on the top of each float. Around noon, the four floats get together in front of Akiba Shrine in the precincts of Shinmeisha. The community members perform Shinto rites, while the Karakuri mechanical doll performance is going on. At last the four floats are dedicated to the Shrine simultaneously; Donten is finally performed and the floats are put back in the hangar within the precincts of the Shrine. The festival comes to the end. The names of the Karakuri of the four floats are Karako-sha, Seio-sha, Yutori-sha and Seiobo-sha. The autumn festival is held at the height of autumn, on the second Sunday of October. The hero in this festival is a horse, so it is called the Autumn Horse Festival. The festival has its origin in the five staffs that Tokugawa Yoshinao, the first lord of the Owari Tokugawa clan, presented to Komaki-juku in the Edo Period. As the people of Komaki were very grateful for the gift, they made an ornament of poles used the staffs and a monkey picture drawn by Yoshinao. A horse was decorated, bearing the ornament on its back and,dedicated to Atsuta Jingu Shrine after being paraded as far as Nagoya. 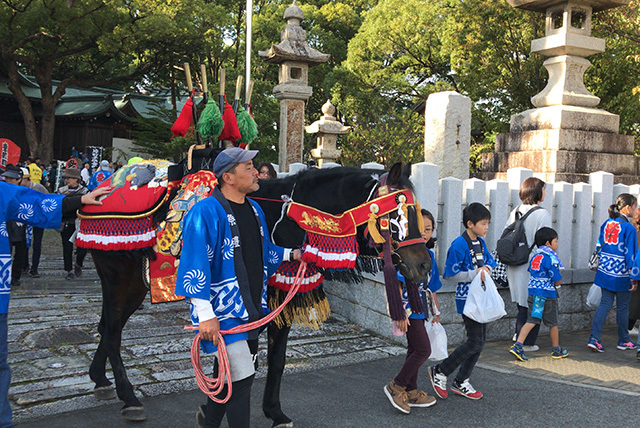 Nowadays the parade to Nagoya no longer takes place, and the horse withan ornamented pole on its back is dedicated to Shinmeisha Shrine inKomaki. This pole-like tower is called the “Omanto”. The original Omanto is owned privately by a person living in Gifu and a replica is used in the festival. 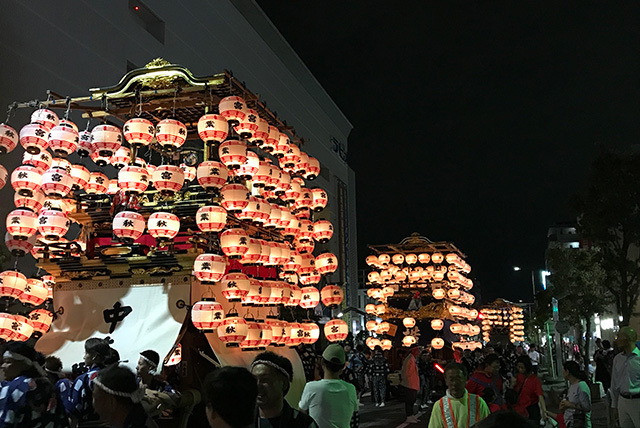 We can see those floats and the Omanto only on festival days now, though they are on display at three big festivals of Komaki Shinmeisha, which are held three times a year. However, you can always see their pictures exhibited on the fence on the north side of Shinmeisha.